Imagine if your car or bike didn’t have a fuel reserve alarm? You’d travel around, oblivious to the amount of fuel left, and get stranded in the middle of the road when it runs dry. Obviously, automobile manufacturers thought of the inconvenience it can cause and put in a reserve tank. And voila! You now know well before you run out of fuel; so you can decide and alter travel distances accordingly. Isn’t that something you should have in your financial life too? Wouldn’t it be great if somebody warned you when your monthly expenses are hitting ‘reserve’? Just to know the amount left in your bank accounts will ensure you make smarter and wiser spends. But then how good is a bank balance SMS when it doesn’t account for that pending bill next week? This is exactly what we thought about when we created this cool feature called Budget Management. Monthly spends can go completely haywire if not tracked. Not to forget making and sticking to a budget helps achieve the bigger financial goals in life. But is it an easy task? NOT. This is where Money View steps in. 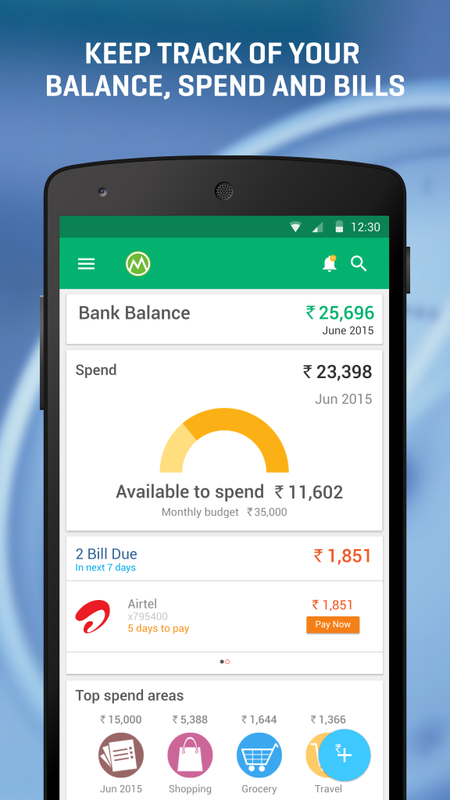 The budget tracking feature on the app is designed to help you save money, over a period of time. It’s simple – you stay in control of your monthly spends; you can make smarter saving choices! And what better a time to get this feature than in the middle of the year? Staying financially organized becomes a focus particularly in January (New Year resolution) and April (New Financial Year), but for the periods thereafter motivation wanes thin. Now though, staying on top of your monthly spends is a stress-free activity – more importantly, it is not dependent on your motivation levels! Just download the app and it does all the work for you! What next am I looking for? MoneyView should bring in the capability of adding reward point accounts/cards together. Like, if I get the reward points for the credit cards and other cards like JPMiles, Payback etc, it would just be great. This is achievable as it can be based on SMS or a webAPI. Shall keep waiting and using! Thank you for your valuable feedback, Kangkan. Your suggestion has been noted. App is not available in UAE. Thank You for this great Application!!! It would be great, if it can read wallet transaction(s) also…. Thanks, Subhankar. We have forwarded your feedback to our technical tea. a small request…. is it possible if we can see wallet (like paytm,mobikwik) balance in one place… like in account section we are adding various bank details and able to see balance. so,in this way we can track the wallet transaction(s) too. Thanks, Subhankar. You feedback has been forwarded to the Money View Team. You can also give feedback at feedback@whizdm.com. I too need this feature. At least for paytm transactions. Update (27th July 17): This feature has been added to MoneyView. I just made a payment via Paytm. SMS received from PayTM and this shows in MoneyView. Exllent using since last one year naver problem found best app in free of cost.